If you happen to see Disney’s summer blockbuster Pirates of the Caribbean: At Worlds End you will know that core to the movie’s plot-line is the Spanish currency and fantasy pirate relic known as Pieces of Eight. Pieces of Eight were Spanish coins used primarily in the 17th-19th centuries and represented eight of Spain’s small common denomination, the Reale. It was not uncommon to cut "pieces" of the coin off as payment since they were made of pure silver and did not lose their value even when offered in pieces. We are featuring our own epic version of this historical coin in our Autumn 2007 catalogue. 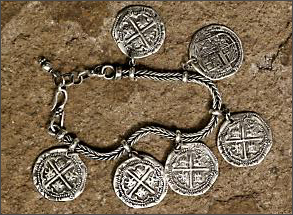 The Pieces of Eight Bracelet offers six life-size replicas of the coin, each uniquely cast and accurate to the tiniest detail. You too can experience the intrigue of a pirate’s treasure or simply own a museum quality accent. Regardless your motive….ye may have ta keep a watch out for thieven scurvy knaves!